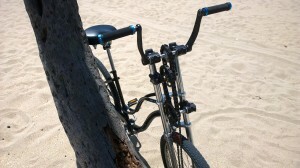 DUAL DRIVE CROSSFIT BIKE | Dual Drive Bike Co....we put fitness up front! The shat drive version is on hold until we raise substantial venture capital for mass production. The prototype works great but I need expensive molds for the top case. The spiral bevel gear manufacturer in China is waiting to proceed with the mass production. I’ve tested his gears and everything is a go pending a venture capital infusion. 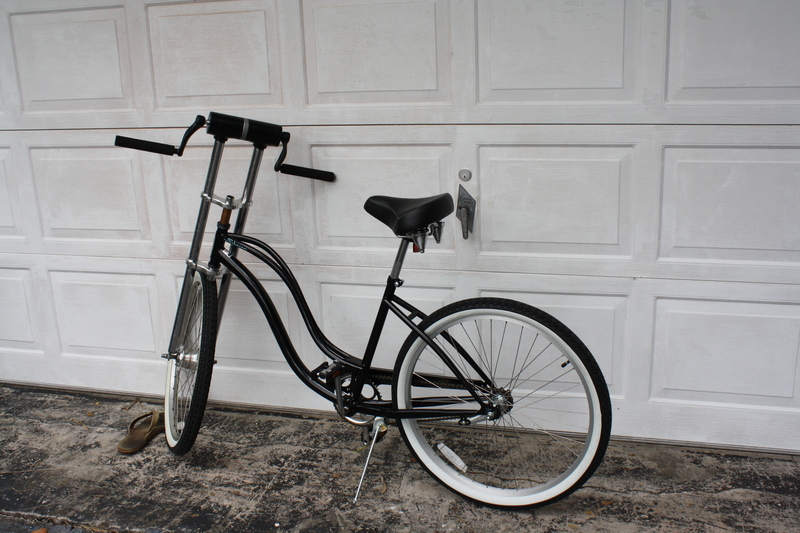 Pictured below is an 8 speed shaft drive bike with our up front conversion kit. So, the technology obviously already exists on bike s and motorcycles. We’ve adapted it to the hand drive as a prototype. Powering the DD bike with either the hands or the feet or both is what separates this bike from the norm! We challenge conventional thinking. Got the new gears in with the correct gear ratio for a smooth steady rotation. I built yet another prototype and the front drive works like a champ! This was major deal as the samples were a test of an overseas manufacturers capabilities and they passed with flying colors. Their CNC workmanship is up to par with the USA and 200% less expensive. 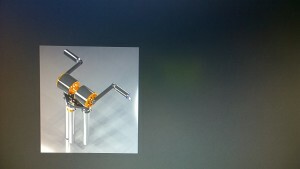 This “concept” is now a reality as we have built our first two successful Prototypes! The latest gear samples are en route and mass production is finally not far off! 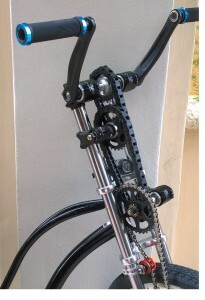 New improved Chain Drive with cool black chain cover! 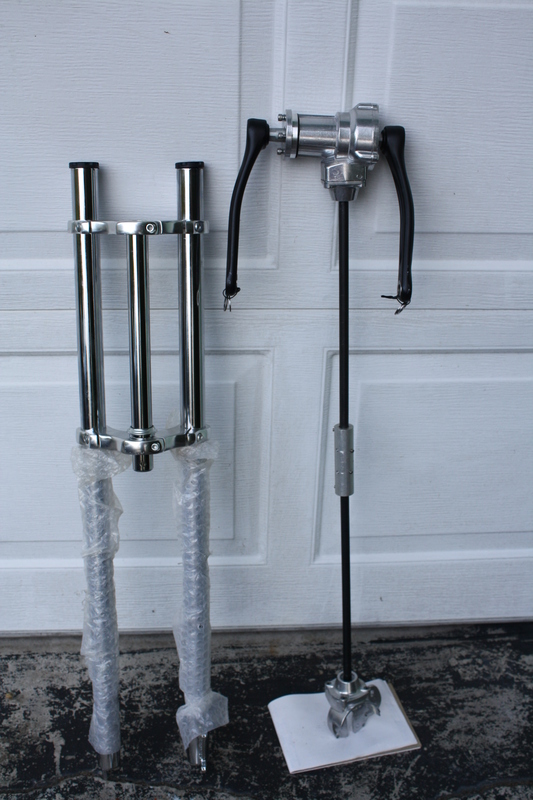 NEW CHAIN VERSION of the Dual Drive Bike….the dual crown fork set up fits the head tube of any bike. The chain sprockets are smaller and covered by a cool looking black chain cover! Using your arms and your legs to power a bicycle just makes sense. Why not? If the first bikes built had dual drives then everybody today would be pedaling that way. 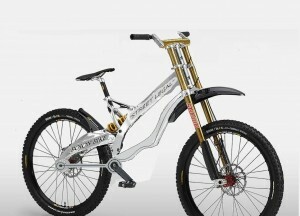 If someone then suggested going back to the basic foot drive bike the question would be why, not why not? Using just your legs is boring! Using just your legs is slower! Using just your legs does nothing for that gut, and nada for the arms, chest and shoulders! The fitness benefits are obvious. The circular rowing motion for the arms simulates the swimming butterfly stroke. Add in the legs and you are exercising all the major muscle groups including: the arms, legs, stomach, back, shoulders and chest. It’s a great cardiovascular workout as well. Any machines at the gym that use both arm and leg movement tout the increased heart rate benefits. Don’t forget the heart is an important muscle, too! You can use just your legs or just your arms or both. 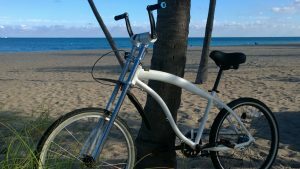 You can stand up on the pedals and just do circular shoulder shrugs, powering the bike at about 8-9 miles an hour while concentrating on those particular muscle groups. Girls, do you want to tone those arms?…..get a dual drive fitness bike today! It’s faster! You’re adding 30% more power to your bike! Yesssir, if you are used to cruising at 18 miles an hour and kick in the extra drive (your arms) you add about 4-5 miles per hour to your cruising speed, (now 22 mph). But who’s into speed, we’re into fitness and cross training for all sports! Re-hab.…the hospital re-hab units are full of arm and foot pedal machines. They know your muscles heal the best using low impact aerobic motion! 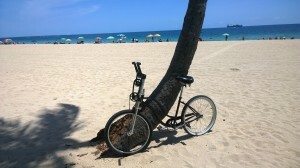 Riding my old (25 years now) dual drive bike has kept me aerobically fit for competitive beach volleyball in Florida. I still play beach V-ball at a fairly high level at age 63. In 2013 I won the Beach Volleyball “Ranse Classic” in Deerfield Beach Florida in November with Olympic partner Steve Grotowski. That is a picture of the shaft drive that I intend to be housed by the dual crown front forks on the left. 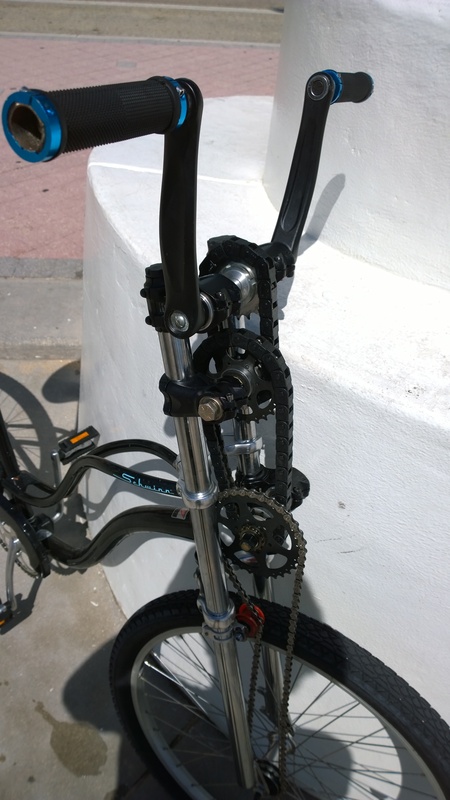 “Go Chain-less” The shaft drive for a bicycle is a new concept for most people. Why? The bike stores don’t carry it. Why? The benefit of no greasy chain maintenance is good enough for me to adopt for my Dual Drive Fitness Bike. Again, my goal is fitness! 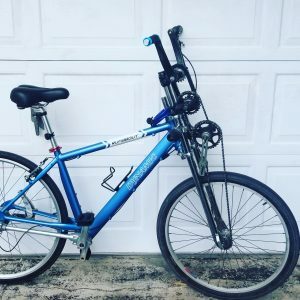 The ability to attach a rear shaft drive to a bicycle with an internal shifting Shimano or Sturmy-Archer hub, makes this a very viable technology for the average person to embrace. They just don’t know it exists. I bought my first shaft drive bike a few weeks ago and I love it! No greasy chain to mess with and get caught in my pants. I have ruined some pants over the years. Few people on the street have ever seen a shaft driven bicycle before! 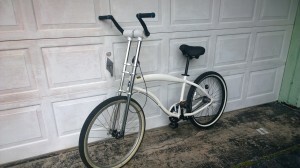 The 8 speed Shimano rear hub shifts and works flawlessly with the shaft drive. Dual Drive Beach Cruiser…so all the beach Volley Ball girls can try it out! 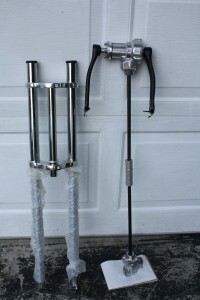 I intend to use two independent shaft drives for my invention. One for the front hand drive and one for the rear foot powered drive. 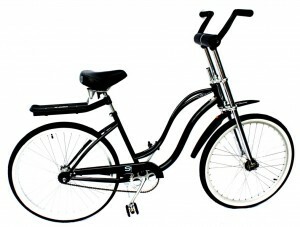 I will probably go with a 7-8 speed Shimano internal hub for the rear and a 3 speed internal hub for the front drive. 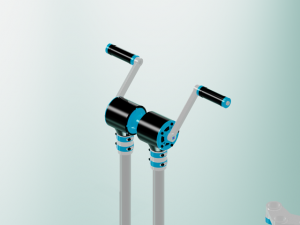 I am patent pending on the novel idea of incorporating the front fork as the outer casing for the front wheel drive shaft. This new innovation will allow me to sell a front wheel drive conversion kit that will fit the down tube of the 100 million+ bicycles sitting around in USA garages. 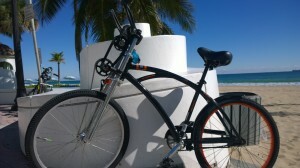 I am initially going to sell directly to the consumer via my web-site complete bicycles only. The “kit” will fit most any frame so write in and tell me what frames you prefer. When we launched the old school chain driven dual drive bike 25 years ago, the world wide web and you tube didn’t even exist. We’ve come a long way baby! The web lets entrepreneurs like me compete by enabling direct sales to consumers that appreciate innovation! Get fit America!